Monday has become my baking day around here. Last week I made the best chocolate chip cookies. I fully intended to share the recipe with you but the cookies were gone before I could get a picture to post. I plan on making up another batch on a day when my hubby is working and the sun is out so that I will have the time and lighting to share just how yummy they look. Yesterday I jazzed up a boxed brownie mix and they were the perfect addition to my coffee and quiet time this morning. I took a chance, before settling in to my comfy leather chair, to walk around the garden and clip anything that might be blooming to add a pretty bouquet to my setting. It doesn't take much more than a few wildflowers and geraniums to make me smile. 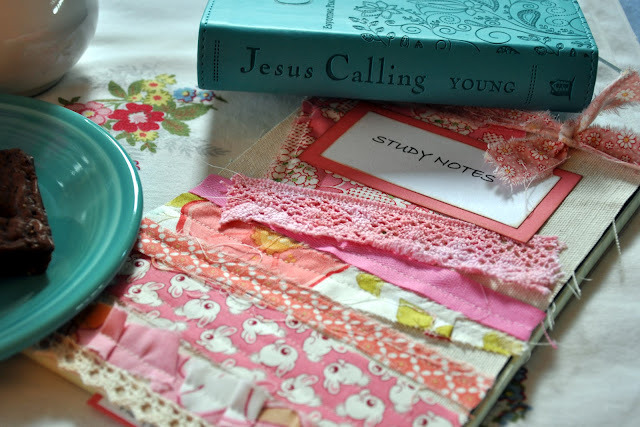 I made these pretty study notebooks for the ladies at my bible study table. We start a new series tonight and I wanted to bless them with a little something. I used scraps of pinks, blues, yellows, purples, greens and reds so they are all different. I think they turned out kind of pretty and it will be fun watching them pick out the one that's just right for them. The sun is shining gloriously here today so I think I'll finish up my second cup of coffee and head outside. Oh my goodness those little journals are so precious! Those are such pretty study notebooks ~ your friends will be thrilled to receive them. The notebooks that you made are wonderful! I have to have my coffee in the morning and then I move onto what needs to be done! Have a wonderful day! Love your vase of flowers by the way! They always bring happiness to a room! The sun may not be shining outside, but it is a good day, nonetheless. The little notebooks you've created are so pretty and will be, I can imagine,a charming surprise for your friends. 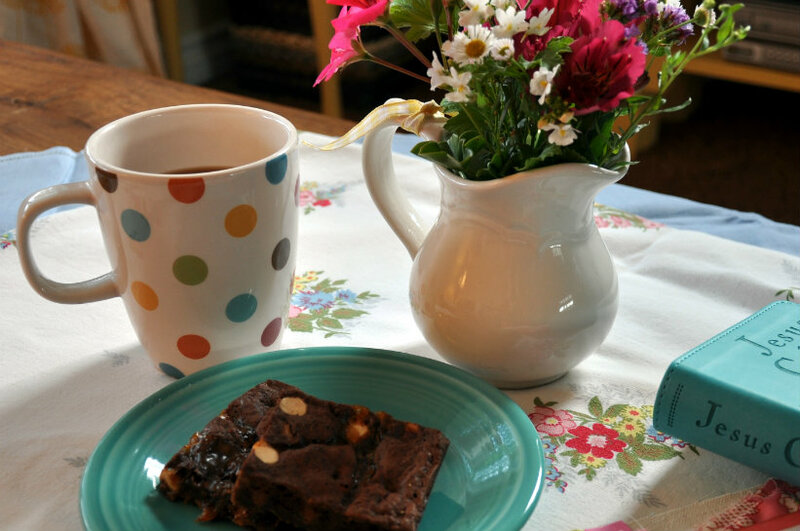 I like the cheerful way you've presented your brownie. 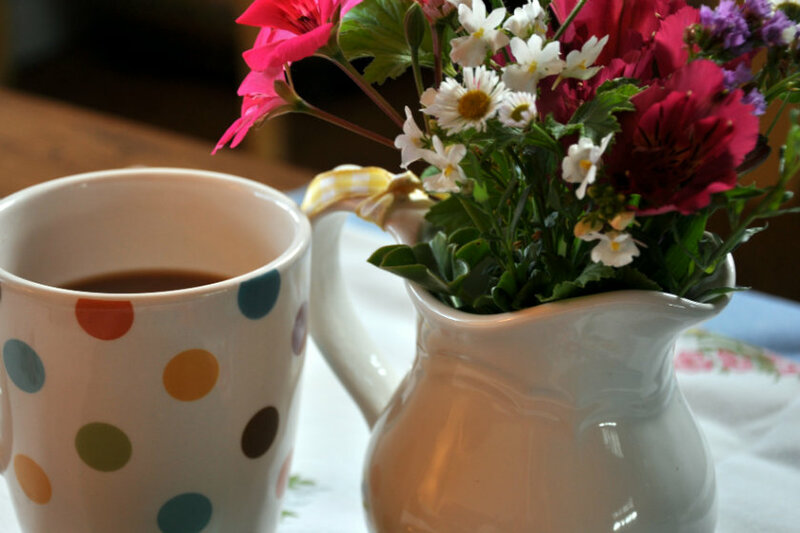 The flowers on the tablecloth and in the jug, the polka dot mug...all so lovely.It's these little touches that add so much to a sense of "home". Have a wonderful day. We had snippets of sun today....which made my jaunt around Didsbury fun! Good morning Patty. Your friends will love your pretty notebooks, and even more special to them because you made them. It is sunny and pretty here today too. I am off for a new "do" and then some sprucing up in the house. What a cheerful happy post! You just brought sunshine to an otherwise gray and rainy day in Idaho. Very inspirational post. It's raining here today (after it snowed). Glad you are finding a routine. I crave mine but the kids are constantly changing it up with their ever changing schedules but I cannot wish the time away. Your photos always make me want to come over for that second cup with you. Your brownies look so yummy.What did you add to the mix. I made some last night, just straight from the box. I'm so envious you have such pretty flowers already. Your journals are so sweet. Your friends will love picking one out. What are you studying. 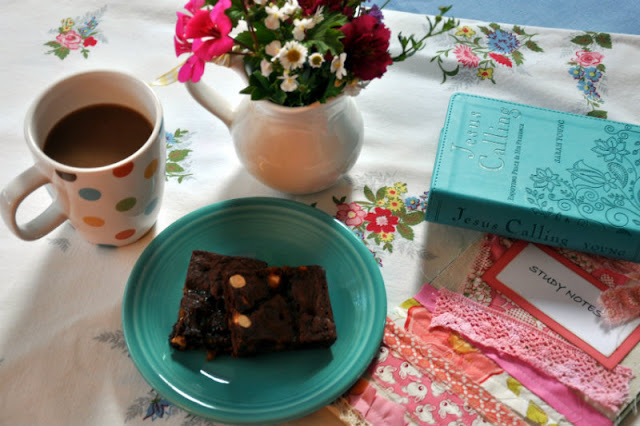 A couple of weeks ago our group started Beth Moore's study on James. It sounds like you are enjoying your days!! The brownies sound good but I don't dare bake for awhile. I baked twice this week and am afraid to weigh in. Your little study notebook is cute. Nifty idea! I like your idea of baking Mondays. The brownie looks delish right now! 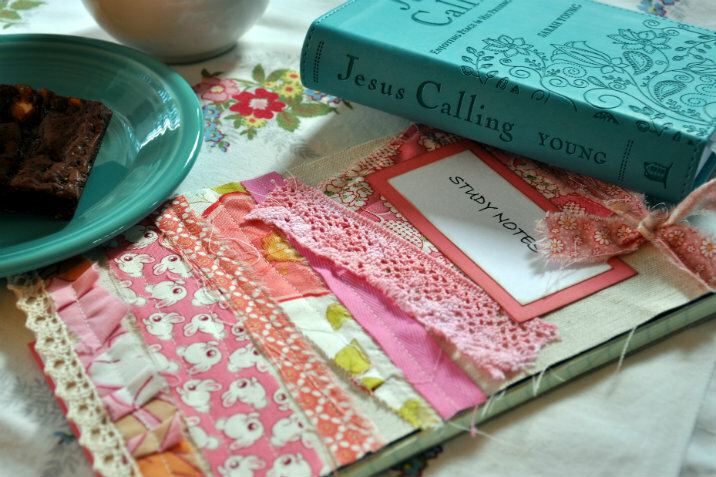 What a pretty set up you have there with the polka-dot mug and adorable journals! You are a girl after my own heart... brownies in the morning! Love the little embellished notebooks that you made; so thoughtful. I'm green with envy thinking about you being able to cut flowers this time of year.... it will be a while before we can do that here. The study notebooks are lovely looking. I'm sure your group will appreciate your thoughtfulness. The garden bouquet is quite lovely as well. The journals are wonderful! How sweet to make them for your friends. Oh, and we have that same devotional and just love it. Love the pretty flowers, Patty. Thanks for sharing. I am still in mud from the new addition. Soon, tho, I can start landscaping! I love your polka dot coffee cup. That would be so cheerful to use every morning. Oooo, I love brownies, Patty. This looks so delicious. How sweet of you to make the journals for your friends. And speaking of sweet, nothing goes better with a cup of coffee. Yum! Isn't it amazing that a few fresh flowers can brighten and make your day? Yes, the sun is shining here today..along with temps in the 70s...lovely. I love your pretty little notebooks, that is such a sweet idea! The flowers are beautiful! Thank you for a cheery post, Patty.